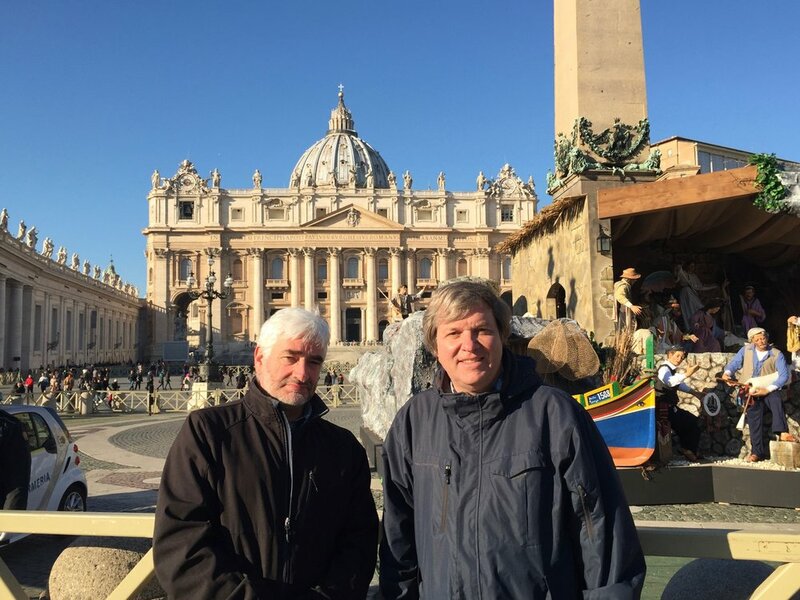 Pace e Bene's John Dear and Ken Butigan are traveling to Rome this week to help lead a pivotal follow-up to the historic 2016 conference on nonviolence at the Vatican. Participants from around the world will meet April 4-5 to share with the Vatican the findings of a recently concluded 18-month research project in which over 100 scholars, theologians, and peacemakers developed content on biblical, theological, ethical, pastoral and strategic dimensions of nonviolence. This material – produced by participants from Africa, Asia, Latin America, North America, the Middle East, and Europe –could potentially provide a framework for a thoroughgoing recommitment to the centrality of nonviolence by the Catholic Church. Dear and Butigan have played active roles in this writing project. The 2016 assembly concluded by calling on Pope Francis to share with the church and the world an encyclical—a major church teaching—on nonviolence. Many steps have been taken since then toward this goal. Pope Francis’s 2017 World Day of Peace message was the first ever on nonviolence (“Nonviolence: A Style of Politics for Peace”), a theme that was proposed by conference participants, including John Dear. Many regional and local conferences have been held around the world, including at a series of universities. Curricula and publications promoting the way and methods of nonviolence have been produced. And since the conference, Pope Francis has energetically called for nonviolence throughout the world in many statements and interviews. In the wake of the first conference, Pax Christi International launched the Catholic Nonviolence Initiative (CNI), which has been relentlessly organizing over the past three years, including this research project. CNI is co-sponsoring the upcoming gathering with the Vatican’s Dicastery for Promoting Integral Human Development. Pace e Bene is a CNI partner, and Ken Butigan—who is a senior lecturer in the Peace, Justice and Conflict Studies Program at DePaul University in Chicago—serves on the CNI executive committee. At this week’s gathering, people from around the globe will encourage the church at every level—its dioceses, parishes, seminaries, universities, schools, religious orders, congregations and institutions—to imagine integrating Gospel nonviolence in practical and concrete ways, including in its processes of formation, education, preaching, ministry and advocacy. It will also encourage the church to invite the entire world to embark on a nonviolent path to confront the global culture of violence. Please keep all the participants in this Rome assembly in your thoughts and prayers as they explore together the next step in this nonviolent journey.